Epaminondos ‘Epi’ Stathopoulo, who named Epiphone after himself, wrote in 1930s Epiphone catalogs that his father Anastasios began the instrument-making tradition in 1873, in Turkey. The family emigrated to America, arriving in New York in 1903. The family name had been Stathopoulos, but the ‘s’ was dropped that year. The company began using the name ‘The House of Stathopuloulo’ in 1917. Their mandolins were high quality and were much sought after until the end of the First World War, when demand declined with the advent of Jazz. Musicians then moved to the new ‘Tango’ or tenor banjo, which was granted several patents. In about 1928, the company introduced a new line of ‘Recording’ guitars, with a unique body shape, which unfortunately did not remain in vogue. However, their ‘Masterbilt’ Series of archtop guitars established the company. The Epiphone ‘Harry Volpe’ archtop guitar used one pickup as shown above. 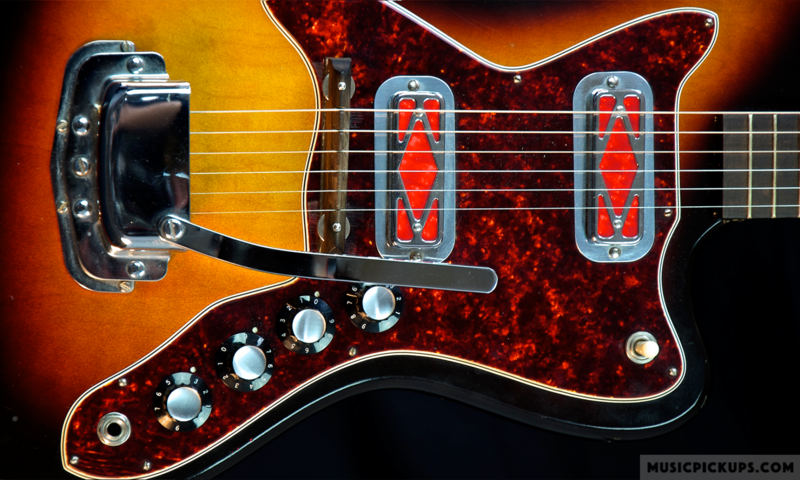 This pickup was used on only one other guitar, the 1956 Rickenbacker Combo 400, with the bezel concealed under the pickguard (photo here copyright Jim Fisch). The Emperor Zephyr Regent guitar used three pickups as shown above, variants of the Model 2000, with gold-plated metalwork and white coil former. Epiphone Century guitar dated 1954, fitted with one pickup as in the Harry Volpe guitar described above; V & T controls with clear cylindrical knobs with slotted setscrews.